I haven't been reading many cozies these past few months, but I was in the mood for one now that the weather is cooler and the skies have been so dreary. I decided to pick up EGG DROP DEAD by Laura Childs, an author who never fails to entertain me. 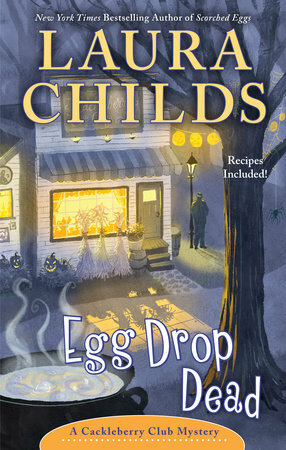 EGG DROP DEAD is her latest in the Cackleberry Club Mystery series, a set of books that stars three women who own and operate the Cackleberry Club cafe. Suzanne immediately calls the local police with whom she has an interesting relationship -- Suzanne has assisted them with murder cases in the past. The lead cop warns her that Mike's killer was a very angry person and that she should leave the investigating to the professionals... but Suzanne can't help by get involved. It's just her nature. Suzanne, along with her besties Petra and Toni, are determined to find this mild-mannered farmer's murderer. Despite his calm demeanor, it's obvious that he upset at least one person. Could it be Mike's wife who was very eager to sell the farm after his death? Or, maybe the wheeler and dealer land developer who just came to the town? Or, is it the even scarier thought that it's someone they don't even suspect? Laura Childs has done it again! EGG DROP DEAD was a fun cozy that managed to keep me guessing. It has fantastic characters whose interactions are both sweet and entertaining, and the murder mystery had some intriguing side stories... that may or may not have been red herrings. In addition, the book takes place in a cafe so there's lot of talk about food and drink. And the author even includes some recipes in the back of the book. What more could a cozy reader ask for? If you are a fan of cozies, you really need to read the Cackleberry Cozy Mystery series! They encompass everything readers would want in a cozy, and you can just jump in with any of the books -- you don't need to read them in order. Ms. Childs has a few other series like her Scrapbooking Mysteries and her Tea Shop Mysteries that you should check out too! I am so excited that I have a copy of EGG DROP DEAD to share with one lucky reader. To enter, just fill out the form below before February 21st at 11:59 p.m. EST. I will randomly select and notify the winner the following day. This contest is open to those of you with U.S. addresses only. Good luck! I haven't read a cozy in a while but they're always a treat! This cold, gray weather is the perfect time to snuggle up with a cozy! Kid Konnection: Celebrate Black History Month!